The possible existence of Earth-like binary planets is being described today at the American Astronomical Society's Division for Planetary Sciences meeting in Tucson, AZ. Two bodies, each of mass similar to Earth, can form a closely orbiting pair under certain conditions present during the formation of planetary systems. This theoretical proposal is completely unlike the Earth-Moon system or Pluto-Charon, where the two bodies are very different in mass, and arises in some "kissing" collisions where two similar mass bodies encounter each other and become a bound system because of the energy lost in the strong tides raised on each other in the encounter. The resulting binary can then persist for billions of years provided it forms well away from the central star, at half an astronomical unit (the distance between the Earth and Sun) or more. This work was presented by undergraduate Keegan Ryan, graduate student Miki Nakajima, and Dr. David Stevenson of the California Institute of Technology in Pasadena, CA. The result does not contradict existing data for planets around other stars but suggests that future data may uncover such systems. This is the first such study to examine the possibility of terrestrial binary planets. During the formation of terrestrial planets, large rocky bodies orbiting around a star occasionally get close enough to interact with one another. If two bodies collide head on or obliquely, then this interaction typically results in accretion where the two bodies merge to form a larger one, perhaps leaving behind a disk of debris from which a moon can form. This is the standard picture for how Earth got its moon and a possible explanation for Pluto's moon, Charon. If the two bodies collide in a grazing manner but at high velocity, then the two bodies "hit and run" and separate from one another once again, failing to form a bound pair. The research presented today searched for a middle ground—a scenario in which the interaction results in two large bodes that do not merge but still remain locked in orbit. This configuration, termed a terrestrial binary planetary system, would necessarily evolve into a state where the two bodies are tidally locked (with orbital period being almost the same as day length for both planets) and with the centers of the two planets being separated by only three or so planet radii (just like the animation in en.wikipedia.org/wiki/Double_planet). There is a good reason to believe terrestrial binary planetary systems may be possible. In a grazing collision the angular momentum is too high to be contained within a single rotating body (it would fission) and if the bodies barely touch then they could retain their identity. However, it requires an encounter where the bodies are initially approaching each other at low enough velocity. To test for this possibility, a simulation technique called Smoothed Particle Hydrodynamics (SPH) was utilized. Smoothed Particle Hydrodynamics represents a body as a collection of tens of thousands of particles, and it has been used to study protoplanetary collisions as well as the giant impact hypothesis of the Moon's formation. Using SPH, collisions between two rocky Earth-sized bodies were simulated, with impact velocity and impact parameter (a measure of how head-on a collision is) being varied and the output observed. In the cases where the bodies underwent substantial collision, the scientists replicated previous results in which a binary system did not arise but a moon might form. However, by including interactions where the bodies are close enough to undergo a large tidal distortion, initial conditions were found that led to a terrestrial binary planetary system. Despite the specialized computer hardware used to speed up the calculations, each simulation still took up to a week to run. Much of this time was spent simulating two bodies approaching one another, a situation which could be easily solved analytically. Using SPH during these stretches was unnecessary and time consuming. To combat this, a novel method was introduced to the SPH code which dynamically switched between modeling methods, cutting simulation time down to as little as a day. With the simulation time long but manageable, the input space was mapped out. Some pairs of impact parameter and impact velocity led to accretion, some led to escape, and some even led to binary systems. Point by point the boundaries between these outcomes began to appear, eventually creating a map of the input space which would give rise to a binary system. Binary asteroids are well established, and systems that have merged to become dumbbells or other shapes have also been detected. Binary stars are also very common. 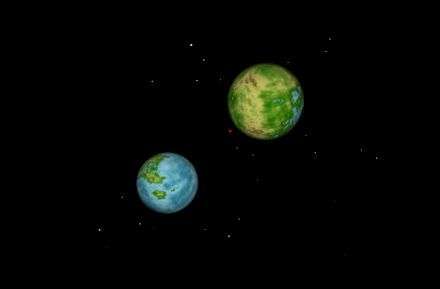 However, binary (or double) planets involving large bodies have only figured in science fiction to now, for example "Rocheworld," by Robert Forward. Too many mays and possibilies. What part of "Can binary terrestrial planets exist" don't you understand? The words are pretty simple. Hint: It does not say "Do binary terrestrial planets exist". The Earth and the Moon are essentially a binary planet system. I don't see why it wouldn't be possible and perfectly "stable" once a sufficient distance was reached. I suspect that they'd be much farther apart if they were both roughly Earth mass. I also suspect they'd be extraordinarily rare. Shut up verkle. I'm tired of you pretending you know more than actual scientists. What gall. Terrestrial planets this close together might accelerate the development of space travel. Life would be much more likely to jump between planets and they could both develop ecosystems based on common genetic material. Establishing colonies on the uninhabited planet would be far easier than us populating mars. This is a "Rare Earth" scenario that I like for once. We are not living on the best possible world (which is already a problem with the actual 'rare Earth' idea). @Selena: Why did you stop after the first blah? Since your comment doesn't make sense - science works (hint: the web you are trolling) - it said "blah blah blah" for everyone. You go to my "ignore" list. I could imagine that if intelligent life developed on both, the first one to develop nuclear weapons and a system to deliver it to their sister planet would wipe the other one out. That's the way it would be if humans were involved anyway. How close together could they be, anyone know? Could they share an atmosphere? Touch? Could you get a dumbbell shaped planet? "This is a "Rare Earth" scenario that I like for once." And the world cares that you like this cuz... narcissist. You're mentally ill and hate reality. "We are not living on the best possible world"
And your feelings toles us soze, right narcissist, yeah. "Science" isn't something you grasp. "(which is already a problem with the actual 'rare Earth' idea)." Take what creationist? TAKE WHAT? What a moron. Take that idioto. "@Selena: Why did you stop after the first blah?" Why didn't you make sense period Mr. I Feeldz Diz Izds Goodz, Uh Dur Datz Disprooodz Cratsinism, yeah dur take dat creatadinist! The Earth and the Moon are essentially a binary planet system. I don't see why it wouldn't be possible and perfectly "stable" once a sufficient distance was reached. I quite agree on that, our relatively large moon (compared to earth) shows at least it's very possible such bodies are perfectly capable of floating around each other. Honestly I don't see what so different about just naming the 2nd body a moon or a binary planet, most of them are just as dead as the moon anyway. A definition of what distinguishes a moon from a dead binary planet would be a good addition to the article. The best scenario would be two (or more) earth-like planets within a habitable zone, liquid water stable on each. You might expect life to flourish on each world and each could have a day of reasonable length. Seems hard to predict, there are many factors where we don't know if it benefits or impairs life. IMO our best binary body example is earth and moon, yet we see no habitable place up there. What effect would it have if even bigger bodies would pull on each other? Is the moon's tidal pull essential, beneficial or of no importance for our existence? Is the length of a "reasonable" day essential or would life adapt & evolve to the day's length..? If there are 2 separate ecosystems, wouldn't things like disease cross infections cause havoc on one or both planets? Because we don't exactly know if life here is due to a fine tuned set of circumstances or that life would flourish even if those circumstances were very different, I'd say it's hard to predict. How close together could they be, anyone know? Could they share an atmosphere? I see no reason why that's not strictly possible, but looking at the size of our atmosphere compared to the distance to the moon, it seems not very likely. Touch? Could you get a dumbbell shaped planet? If a dumbbell kept rotating the same way as they did as separate planets and had 2 distinct centers of gravity, it could, but again it doesn't seem a very likely scenario. With such distances they'd probably sink into each other's gravity centers and become a round body eventually. No. The distances would be far too great (atmosphere is a VERY thin layer for planets like ours). We are living on the best possible world for humans. Humans have adapted to this planet since the first organism started evolution off. Even with such a huge universe out there the chance that any other world can support human life unaided (let alone be better suited) is virtually nil. The article actually states that they would be quite close, much closer than the earth & moon.